those lovely Pink Fresh acetate triangles so I kept everything pretty sparse apart from some black soot mist sprinkles. The bottom dusky pink strip is the branding paper from the Wanderlust Brished paper used on my last layout. Those strips are always good for a little extra border. I had a spot of bother adhering the triangles. I tried tape and glue but they were both rather visible so I used the tiny attacher instead. If you have one of these but didn't know you could do this there is a great tutorial here that I always have to go back to as I can never remember how to do it. I was a bit heavy handed (who me?) with the stapler and bent my cardstock a bit so do be gentle. I cut out lots of little bits of foam squares to layer up my die cut phrase - fiddly but worth it to stop it getting totally lost on the page. I did consider colouring it but I do like the white on white. The last detail was journalling on the copper strips from the main kit and adding one Pink Fresh and two little MAMBI stickers to finish it off. I'm not a project life scrapbooker, but I am a pocket page scrapbooker. Sometimes I take too many photo's and if you were to document them all on traditional layouts, you'd have a whole album on one subject...where as if you use pocket pages you can get a tonne of photos, plus journalling on a few spreads... Here's how mine turned out. So as you can see I was able to incorporate several parts of the kit into my Project Life pages. Here are some close up shots to show you in better detail and I will describe what I used. So I usually make a title card when I'm doing these kind of layouts, and for this title card I used some of the Heidi Swapp Cafe paper from the Main Kit as a background. I then used some of the October Afternoon Mini Market alpha's (lite kit) and layered them on one of the glittered Kraftastick stickers (Embellishment kit) for my title. I used one of the MAMBI Denim Blues stickers and the first of the 2 fawns that came in with the main kit, one of the copper foil labels and also some of the xoxo thin washi also from the main kit. The Denim Blues stickers are so versatile and used them a lot throughout this spread. I also used some of my leftover Pistachio cardstock for journaling and some of the green triangle side of the Simple Stories So Fancy Triangles paper to make filler cards which I embellished with another kraftastck glittery sticker and some enamel dots. The Inspire 4x4 cards also worked perfectly for this layout. I used one for a filler card and another for journalling. I finished my layout with some of the MAMBI happy planner puffy stickers. I'm pleased with how it turned out and it was a great way of documenting my time at Versailles. For this layout I knew I wanted to use this Pink Fresh Studio's Rustic Triangle paper from the Main kit...I love the woodgrain and also the white triangles floating downwards in a diagonal direction. The hardest part of the this layout for me was not to cover up those triangles, and i'm pretty happy with the end result and I think the 2 pictures of the Mickey and Minnie Bronze statues compliments the paper really well. I backed the photo's onto some of the Colourset Dark Grey cardstock (also from the main kit) to make them pop a bit. OOOOH and not to mention...if you watched my unboxing video's on Youtube you will have seen me talk about the lovely polka dot packaging that the embellishments came in....yep! I said I would find a use for it and I did just that...doesn't it look awesome behind my photographs...it makes a great layer and works really well with the grey circles I punched. 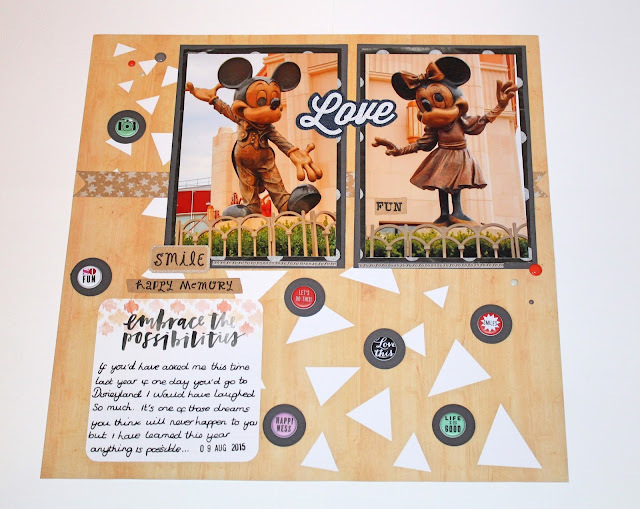 For my embellishing I took some more of the dark grey cardstock and punched out some circles with a 1 inch circle punch and then used some of the MAMBI puffy stickers from the Embellishment kit to give the layout some dimension and they also describe my feelings on my Disney weekend. Behind the photo's I used one of the kraft adhesive border strips from the Ruby Rock-It Bella Krafastick sticker sheet (embellishment kit) and a couple of the sayings stickers from the same sheet. 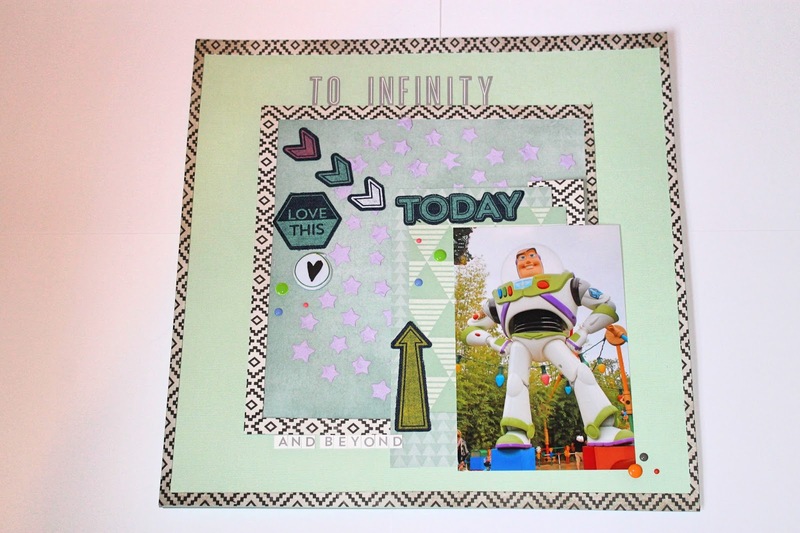 I wasn't sure whether I wanted to journal on this page or not but without the journaling I felt the page looked a bit bare so I chose one of the Inspire 4x4 cards (embellishment kit) titled Embrace the Possibilities, which I felt was really fitting. I finished off the layout by adding one of the WRMK denim blues stickers and of course some enamel dots both from the embellishment kit...because no layout is complete without enamel dots lol. 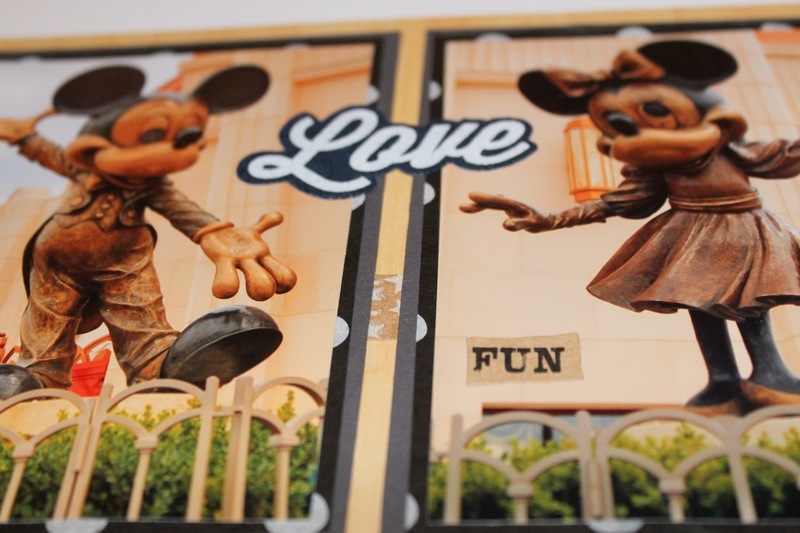 This layout now takes pride of place near the beginning of my Disneyland album alongside another layout where I focused on the creator...Mr Walt Disney himself...but that's for another post! I LOVE that stripey Heidi Swapp Wanderlust brushed paper from the main kit. But I also liked the way that the other watermark patterned side toned in with the wall on my photo. Stripey? Or watermarky? There was only one way to find out... I cut it in two. It was prompted by one of the main kit sketches (they should be appearing on the blog soon). Though, as usual it doesn't look so much like it now! ... and made two layouts! this one is about the bowl of cockles and laverbread my hubby had on holiday. Laverbread isn't bread and has nothing to do with volcanoes. It is a type of seaweed that looks a lot like spinach when cooked and is what Richard Burton called "Welsh caviar" - hence the title. 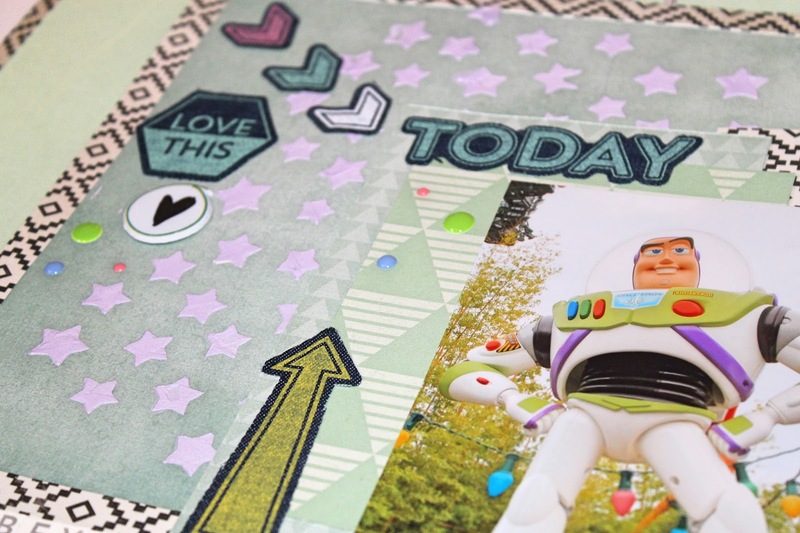 I began the layout by using white texture paste and a star stencil on the cardstock. While that was drying I gathered a few sheets of paper, my last strip of that awesome dotty transparency and some of the Project Life Inspire cards. I cut up the Pretty Little Studio Love This journalling card from the main kit and put part of it behind the "love" square and part behind the photo. I added some extra pen lines to the Pink Fresh Studio Happy Things Ombre Mosaic paper so it echoed the style of the "love" square a little more. When the texture paste was dry and stuck down the papers and photo and went to town with all the lovely embellishments from the Palette kit Those little puffy stickers are just adorable and there are loads of 'em. The denim sticker added some touchy feely lovliness. 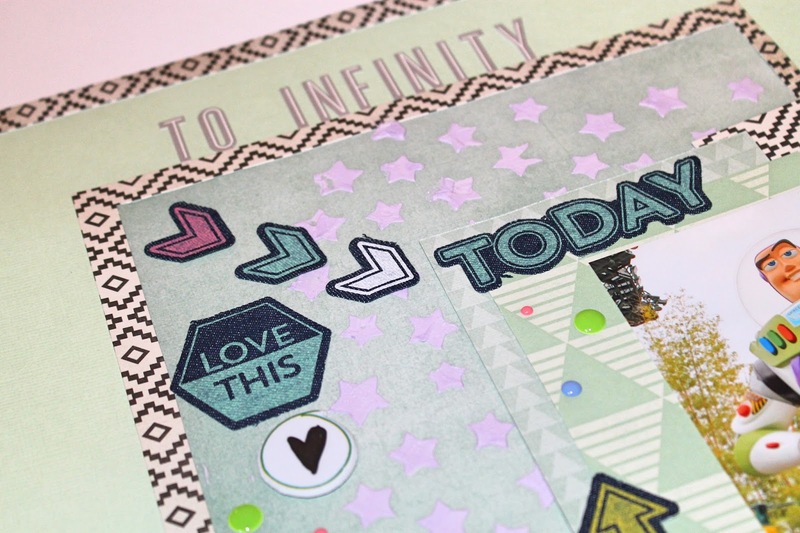 The title uses Daily Flash stickers from the main kit, highlighted by that delicate xo washi tape. It features on loads of my layouts in a way that I tend not to use normal tape so maybe I better start cutting it in half! I happened to turn a piece of the Happy Things Ombre Mosaic over and it was the dquare with "smile" on it that I thought would be a great piece to base my layout on. I chose some papers that echoed the colours. The blue polka dot is one of the Project Life cards cut up. I decided that seagulls love sparkle (or is that magpies?) so I took the heart shape journalling card and covered it with a diamond sparkle paste. I spent ages trying to get the heart and the photo and the "Smile" in the right place. I even took a photo. It was looking perfect until suddenly it wasn't. I had needed to slice through the top left corner of the heart but didn't need that any more - so the sticker came in handy! I also added a little tag to the right of the photo to cover an annoying gap that wasn't there on the version before sticking everything down. The stickers are from the main and the lite kit and I used all of the same embellishments as I did on the layout above. I had a great deal of fun making this layout and managed to get the most of the Wander patterned paper from the Journey collection by Crate Paper which came in the Main kit, and also the Kaisercraft Pistachio textured cardstock. I used the pistachio cardstock as a base but cut out an 8 inch square from the middle to save for a different layout. I filled the 8 inch space with the Simple Stories mint watercolour paper from the lite kit. I then cut an 11 and a half inch square out of the Wander patterned cardstock leaving a half an inch border which I adhered to my base. I cut an 8 and a half inch border again from the pattered cardstock and used this to create a window in the middle as seen in the picture below. Before I put anything else on my layout I took some liquitex modelling paste and Martha Stewart pearlescent lilac paint (both from my own stash) mixed them together, and using a stencil I cut from my Silhouette Cameo spread the mixture through the stencil to create the stars. After it dried (about 10 minutes) I layered my Buzz Lightyear photo on some more of the Wander paper and also some of the Pink Fresh Studio Rustic Triangles patterned paper from the Main kit. Because of the angle of the photo I'd taken I decided it was best in the bottom right hand corner. For embellishing I used some of Happy Things puffy stickers from the Main Kit, some of the WRMK denim blue stickers and finished it off with some of the enamel dots both from the Embellishment Kit. I will admit halfway through doing this layout I had no idea if I was going to like the end result as I'm not used to working with this kind of colour palette, but after I was finished I loved it. I think picking the colours of Buzz Lightyear but keeping everything subtle really draws the attention to the photograph. I'm now looking forward to making more layouts similar to this. The thing I most love about these kits is because I haven't picked the items, I'm challenging myself out of my comfort zone and it's really working out for me....now I challenge you..yes you reading this to have a go at a layout using colours you never use...you might just surprise yourself!